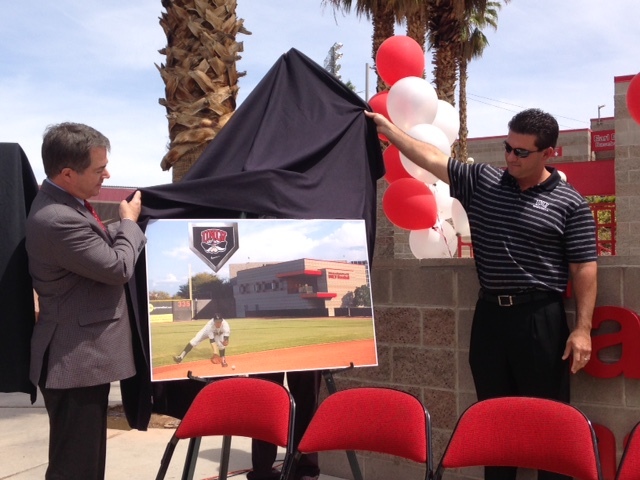 UNLV’s Earl E. Wilson Stadium will have a new look next spring with the addition of the $2.75 million Anthony and Lyndy Marnell III Baseball Clubhouse. 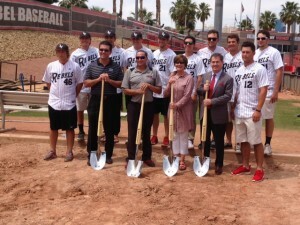 The two-story complex, which will be located down the first base line and replace existing batting cages, will total 10,000 square feet and include coaches offices, a players lounge, an academic area, two indoor batting cages, a weight room and conditioning area as well as a new locker room for the Rebel baseball team. The second floor will also include a patio that overlooks the field. Anthony Marnell III, the President and minority owner of the M Resort Spa Casino, played baseball for Chambers at Bishop Gorman and earned a baseball scholarship to the University of Arizona. He played two years of minor league baseball in the San Diego Padres system before returning to Las Vegas and completing his education at UNLV where he earned a Bachelor of Science degree in Hospitality Administration. Afteward, Marnell, Chambers, UNLV athletic director Tina Kunzer-Murphy and Jessup posed with shovels with the baseball team on the site of the future complex as seen in the picture below.